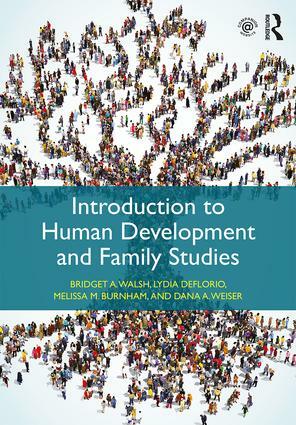 Introduction to Human Development and Family Studies is the first text to introduce human development and family studies (HDFS) as inextricably linked areas of study, giving students a complex yet realistic view of individuals and families. Pioneers of research paradigms have acknowledged that the family is one setting in which human development occurs. Moreover, in many academic programs, the lines of these two disciplines blur and much work is inherently multidisciplinary and interdisciplinary. This book helps to fortify an understanding of HDFS and subareas within it. Who are the people involved in HDFS? How does theory and research inform work in HDFS? What does the pursuit of being an ethical professional require? What are the key areas in HDFS? Chapter Summaries where the main points of each chapter are pinpointed at the end of every chapter for review and study. Key Terms listed and defined within the margins of every chapter, a complete Glossary at the end of the text, and Flashcards online for additional review and study. Challenge: Integration section at the end of each chapter that underscores concepts from the chapter and draws connections between content presented in other chapters. Journal Questions to encourage reflection about the content and encourage thinking about some of the content coupled with students’ own experiences. Suggested Resources that lists relevant websites, books, articles, and video links for further study. A Closer Look at Applied Experiences Appendix outlines the internship process and shows how the internship experience can be meaningful and useful, and a Consuming Research Appendix that focuses on what it means to be a consumer of research, the knowledge and skills consumers need, and considerations for transitioning from a consumer of research to a producer of research. Who Are the People Involved in the Area of HDFS? What Is the History and Future of the HDFS Field? What Are the Key Areas within HDFS?